Finding the right property for a new facility can make or break a project. For leading Class 1 railroad BNSF, selecting the site for its El Mirage automotive distribution operations was a top priority. The facility was needed to provide distribution services for several major automobile manufacturers and vehicle-inspection and rental car redistribution. BNSF turned to TransDevelopment to handle site selection – and to design and coordinate the construction of the $16-million, 65-acre facility. The TransDevelopment team of experienced professionals found the best site and provided full planning, permitting and preliminary design services. TransDevelopment developed the facility under a turnkey design/build contract with the railroad. 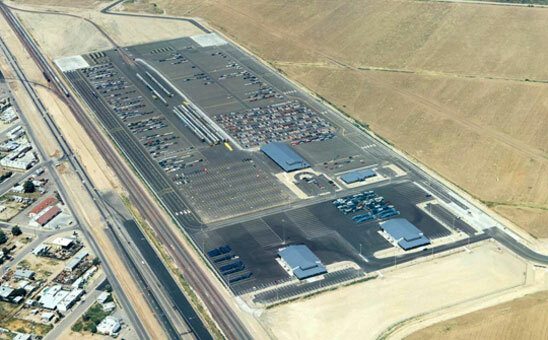 The distribution facility includes two haul-away truck terminals complete with maintenance shops and dispatch offices.